Through imagery, music, and art, Tiffany Campbell and Andria Lessler’s film documents the inner spirit of modern day surfers Stephanie Gilmore, Sally Fitzgibbons, Coco Ho, Silvana Lima, Sofia Mulanovich, Kassia Meador, Ashley Davis, Prue Jeffries, Belinda Baggs, Ashley Lloyd, Judith Sheridan, Liz Clark and early pioneers like Linda Benson, Jericho Poppler, and Rell Sunn and the heart of their experiences. 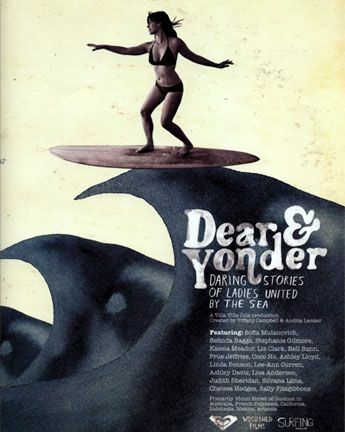 The film also features some female skateboarders shredding. Special Guests include Director Tiffany Campbell, Kassia Meador, Sofia Mulanovich, Linda Benson, Jericho Poppler & Jan Sunn-Carreira. There will be a display of artwork created by participants of the film including Kassia Meador, Tiffany Campbell, Jeff Canham & Blakeney Sanford. Additional support from: Roxy, Steer Crazy, Primo Beer, Barefoot Wine, Malama Composites, Sambazon, Smart Water, and Vita Water.